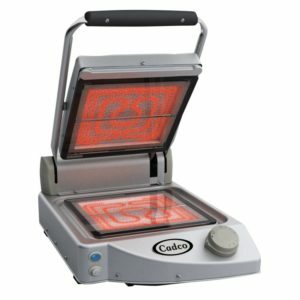 Considered the “Fast Grill System,” the Cadco Clamshell Grill (CPG-10FC) uses both cooking by contact to create an even, uniform cook on the surface of food and infrared rays to penetrate to food to its heart. The Cadco Clamshell Grill makes beautiful looking-food that your customers will surely enjoy! Even frozen food products don’t stand a chance as the glass cooking surface is designed to resist thermic shocks, cooking frozen food evenly at a maximum temperature without damaging the surface of the grill. The Cadco Clamshell Grill uses balanced covers to allow the cover to remain parallel to the cooking surface. Cooking food with a maximum height of 2 ¾” evenly grills thicker sandwiches or other foods. Cleanup is quick and easy too as the surface resists carbon residue buildup, and is smooth and non-porous. MET; NSF through UL Standards / listed by UNOX S.p.A.